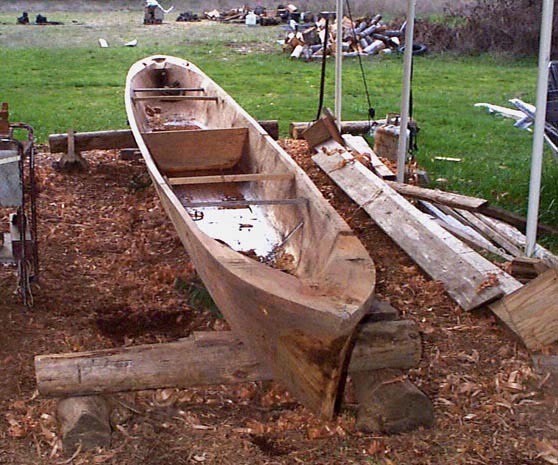 Gudakut, a Kalapuya cedar dugout canoe. Gudakut - (Tree Frog) - A Kalapuya cedar dugout canoe. We carved this Kalapuya canoe in 2005 for the Kommema Cultural protective Association, a group of the Kommema band of the Kalapuya Tribe. Esther Stutzman, a Kalapuya elder, was absolutely central to getting Gudakut carved. There was very little information to guide the making of this canoe. I chose the basic shape of the central section of the hull to conform to the lines of a shovel-nose river canoe. The hull ends are based on the Kalapuya canoe at the Marion County Historical Museum at Salem Oregon, and on two descriptions from the 1930's. One is from John Wacheno, a Clakamas elder, who recorded excellent descriptions and sketches. This material was from the huge Southwest Oregon Research Project (SWORP) Collection. We would never have found this indispensable information with out the help of David Lewis, the manager of the Cultural Resources Department for the Confederated Tribes of the Grand Ronde, who did so much to create the collection. The other description is from Esther's uncle Joe, who described a ride in a Kalapuya canoe in 1930 on the Coast Fork of the Willamette River at Cottage Grove Oregon. 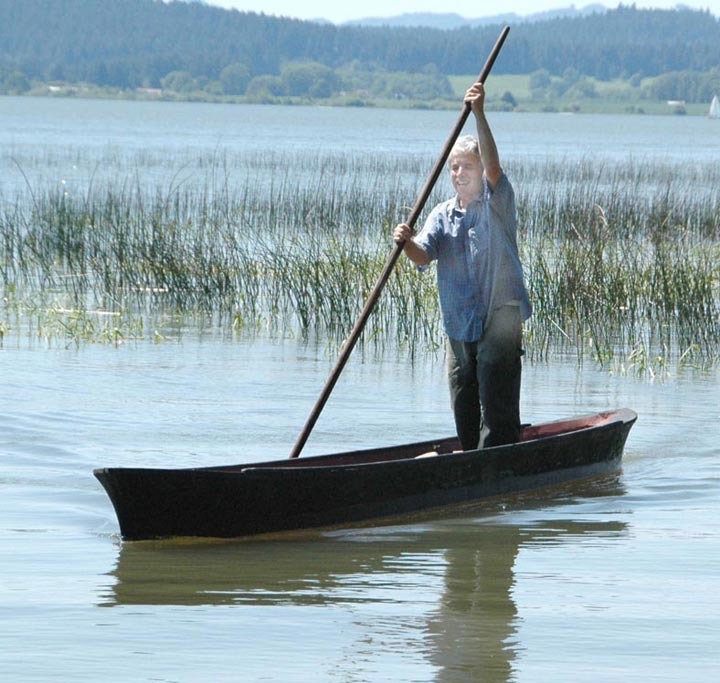 John Wacheno said that these smaller canoes were used to carry news up and down the rivers in the Willamette Valley. I followed his sketch of the profile of the canoe. Uncle Joe said that the canoe was pointed at both ends and that the ends were sharp so that it looked like canoe could plow through something. He said that the canoe was 80 years old. 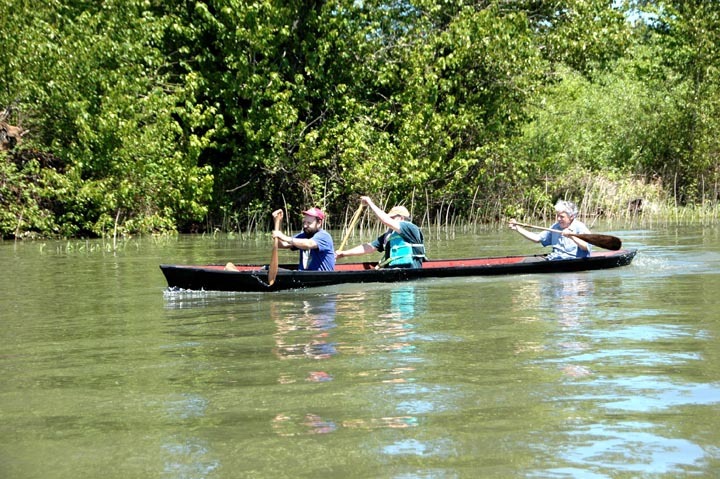 US Forest Service archaeologist and anthropologist Tony Farque helped with interpreting the shape of the bow of the canoe at Salem. Esther's brother Jim Cederstrom did quite a lot of the carving on this canoe. The canoe was carved with straight sides. Then it was steamed open using water and fire-heated rocks to spread out the sides into a curved shape. The donated log was fire-killed and brittle so the hull did not steam open as much as we had hoped. The hull is narrow and needs ballast for stability, but she is very fast. Gudakut has raced several times at the Coquille Indian Tribe's Salmon Days. She has also been featured at the annual Kalapuya Pow Wow in Yoncalla.